From 2,400 miles away, I could feel it. Here in Tallahassee, Florida with 20 members of the UB Athletic Department, the smiles showed the pride. The pride signaled the arrival – the arrival of a college athletic program that has been scratching and clawing for respect, both inside of Buffalo and nationally. I have been involved in broadcasting Bulls sports since 1992. I have seen the struggles of an accelerated move from Division III to Division I in less than 25 years. There was always the belief that UB could be a sleeping giant, with its resources, academics and big city setting. There have been spurts – a MAC Football Championship in 2008, Khalil Mack’s first-round pick, three previous MAC basketball men’s & women’s championships – that laid the groundwork for what’s happening now. 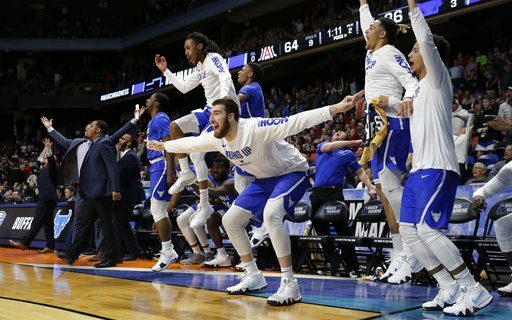 But when you pull off one of the biggest upsets in the NCAA Tournament, that signals to everyone that you have arrived. I’m in Tallahassee covering UB’s at-large appearance in the NCAA Women’s Tournament. They play the other Bulls, South Florida, on Saturday afternoon at 1:30. How about that for a day of basketball? No Buffalo sports fan needs to leave his or her couch to watch about several hours of UB hoops on national television. Why? Easy. After 19 years as a Division One program, everything is falling in place. Major programs like basketball and football are winning. Talented coaches are in place, and the administration is keeping them around with new contracts. The last three athletic directors have advanced to major programs, and the next UB AD will come from one. Recruiting is reaching new heights, and top players are adding Buffalo to their lists. Most importantly, a notably indifferent pro sports fan base of WNY is starting to see how much fun it is to watch college sports. There’s room for a major college program in Buffalo. Yes, we’re a Bills town first. A Sabres town second. But it’s OK for UB to hold that third spot, fill its seats and establish a solid core of fans. There’s no reason why Buffalo has to be only a pro sports town. The momentum gained by the men’s and women’s basketball teams this year will continue into next season, as both teams bring back key core players and have new talented ones on the way. That’s the key to making sure a win over Arizona isn’t a single moment in time that is soon forgotten. Consistent winning is how you build. I already laid out why football will be a must-watch in the fall. I didn’t even talk about a dynamic quarterback (Tyree Jackson) who has two years left and may be a prime prospect in the 2020 NFL Draft. Yes, I’m biased. But that allows me to bang the drum with a level of knowledge and understanding of why this is so important. College sports are a different kind of fun, but no less engaging than a Bills Sunday. Buffalo is starting to know that. The nation knows it now. The Bulls’ best is yet to come.